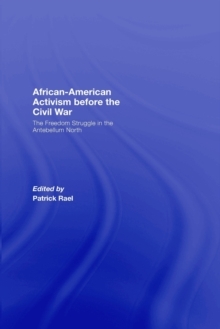 African-American Activism before the Civil War is the first collection of scholarship on the role of African Americans in the struggle for racial equality in the northern states before the Civil War. Many of these essays are already known as classics in the field, and others are well on their way to becoming definitive in a still-evolving field. Here, in one place for the first time, anchored by a comprehensive, analytical introduction discussing the historiography of antebellum black activism, the best scholarship on this crucial group of African American activists can finally be studied together.